Enjoy this freshly baked snack in just 25 minutes. 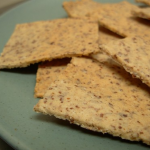 An easy low carb and keto cracker made with almond flour and flax seed with garlic flavor. Mix almond meal, ground flax seed, water, Parmesan cheese, garlic powder, and salt together in a bowl. Set aside until water is absorbed and dough holds together, 3 to 5 minutes. Put dough on the prepared baking sheet and top with waxed paper or plastic wrap. Flatten the dough to 1/8-inch thick using a rolling pin or your hands. Remove waxed paper. Score the dough with a knife to make indentations of where you will break the crackers apart. Bake in the preheated oven until golden brown, about 15 minutes. Remove baking sheet from oven and cool crackers to room temperature, at least 30 minutes; break into individual crackers.